The head teacher of a British primary school has urged parents not to wear pyjamas when bringing their children in, for fear of setting them a bad example. But pyjamas, far from being seen as dowdy and scruffy, were once at the very apex of fashion. The Lido, Venice's most famous beach, has been known for more than 150 years for its sophistication. So, an advertising poster from 1927 comes as something of a surprise. It proclaimed to potential wealthy visitors that the Lido was "the beach of sunshine and pyjamas". Its sands and hotels were places where people could feel comfortable spending days and evenings relaxing and partying in a garment today associated with bedtime, convalescence or days slobbing out on the sofa. In a week where a head teacher in Darlington has told parents not to do the school run wearing pyjamas for fear of not setting a "good example" to their children, it's hard to believe they were ever haute couture. But the 1920s were a different time. While pyjamas - from the Hindi "paejama", meaning "leg covering" - had become established nightwear for men since the 1870s, it was seen as adventurous for a woman to wear trousers of any kind, especially in public. The force for change was the French fashion designer Gabrielle "Coco" Chanel, who decided baggy pyjama-style trousers - complete with a loose-fitting shirt or a sleeveless top - could combine elegance and comfort. As early as 1918, she began wearing "beach pyjamas". With their gender-confusing suggestion of the boudoir, they were seen as shocking, but such was Chanel's influence that they became popular among rich women by the mid-1920s. The up-and-coming resort of Juan-les-Pins on France's Cote d'Azur marketed itself on being less stuffy than rival destinations and became popularly known as "Pyjamaland" in English and "Pyjamapolis" in French, so commonly worn were they among its visitors. Some chose Chanel-style fashion pyjamas, but others, seemingly for fun, spent their days outdoors in actual bedtime pyjamas, complete with dressing gown. "There is a town in France, where summers start at the beginning of spring and ends at the end of autumn," wrote the journalist Robert de Beauplan in 1931. "There, you can see women wearing strange dresses. It's strictly speaking Pyjamapolis." In the same year, Vogue magazine was advertising pyjamas as "woollen suits for the beach". In 1932, two women wearing brightly coloured pyjamas caused a stir on Brighton seafront as they promenaded while smoking pipes. 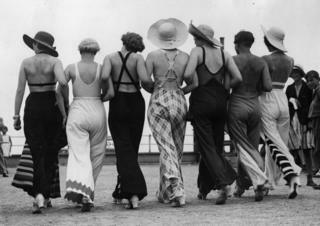 "Throughout the 1930s the styles spread further and could be seen lining the beaches of Britain, yet trousers for women remained somewhat taboo outside of the relaxed dress codes of the beach or the privacy of the home until later in the century," says fashion historian Amber Butchart. Chanel herself discovered this attitude on a visit to Juan-les-Pins. The story goes that a doorman refused her entry to a casino. Its owner, Edouard Baudoin, intervened, saying: "Mademoiselle Chanel, you are living proof that one must not be merely dressed, but well-dressed." The publicity seemingly did neither Baudoin or Chanel any harm. By World War Two, the craze for pyjamas was fading, with the swimsuit overtaking it as the female beach clothing of choice. Chanel was again among those at the forefront of its popularisation. The post-war period saw the more revealing bikini take over. But Robert de Beauplan's observations are a reminder of the effect pyjamas had on the inter-war world. They gave "women an unprecedented look, more free, cheekier, and its relaxed attitude always remains tasteful", he wrote. There were simple "classic" versions available, he added, and "more dressed-up" types, with a lower cut, especially at the back. "It's the afternoon outfit, for visits, tea, dancing and cocktails," wrote Beauplan. "There are also night pyjamas, which look like dresses from afar when you see them in casinos, until you see the person dance quickly the fox-trot and then, there's no mistaking." The world of fashion has seen a resurgence of interest in pyjamas as daywear recently, with some designers including them in their collections. In 1921, she launched Chanel No 5, still one of the world's best-selling perfumes, and later popularised the "little black dress"
But they've become controversial again for a different reason. Kate Chisholm, head teacher of Skerne Park Academy in Darlington, County Durham, has complained that parents are turning up at school dressed in them. She's urged them to "dress appropriately in day wear", arguing this will set their children a better example, increasing pride and academic achievement. Similarly, in 2014, US fashion commentator Clinton Kelly remarked there had been a "downward spiral of style" over the previous decade. Adults who might pop to the local shop for a pint of milk or newspaper wearing slippers and pyjamas felt they had "permission not to care" about sartorial standards. Some of the Skerne Park parents, who have been vilified on social media, could at least take succour from one of Chanel's best known remarks: "It is always better to be slightly underdressed."